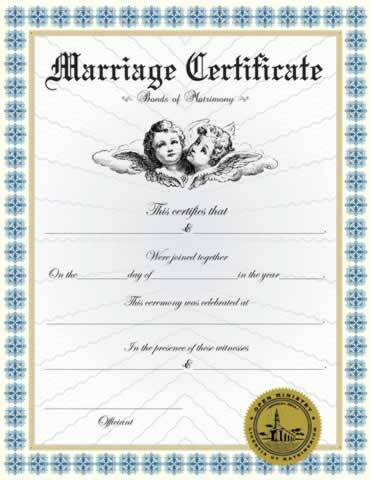 This personalized Marriage Certificate II can be pre-printed with names of the couple, date and location of ceremony, names of witnesses and person solemnizing the marriage. Decorated with our gold embossed ministry seal. NOTE: Most fields are optional. Information not filled in will remain blank on certificate to be completed by the couple, minister and/or witnesses. Certificate will be imprinted with the information exactly as entered. Please double check the spelling and capitalization. We made a great big mistake on the first marriage certificate with the names and we needed to replace the marriage certificate with a new corrected one and Open Ministry not only was able to replace the marriage certificate but was also able to do the printing correctly for us and in record time, for the newly wedded couple. Actually the second marriage certificate was much better than the first for this couple. We loved the certificate. It made the wedding even more special.